Sweetest Day of Sweetest Week–I’m Sure Now Available! 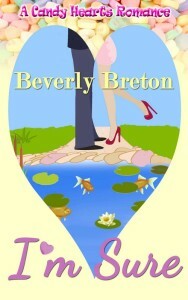 And for the grand finale of this Candy Heart Series here, my own story, I’m Sure, is out today! Pond designer Megan is not sure she can trust a man again, and Jason, a firefighter, is the poster boy for unpredictable. Is St. Valentine powerful enough to bring these two together? After working at a nursery similar to the one Megan works at, I can tell you for sure, life is better around water ponds. And who doesn’t feel better when there’s a hunky fireman nearby? I hope you’ll enhance your Valentine’s week by spending time with Megan, her water gardens, and soon-to-be hers hunky firefighter Jason? You’ll have to find out!